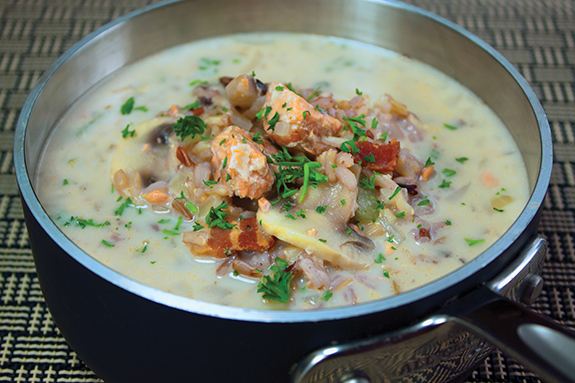 Salmon shines with wild rice, mushrooms and rosemary in this satisfying Mushroom, Salmon and Wild Rice Soup that’s pure Pacific Northwest comfort food. A real treat on a cold and rainy day. In a soup pot over medium heat, sauté the bacon until crisp. Using a slotted spoon, transfer to paper towels to drain. Add the onion, celery and mushrooms and sauté until soft. Stir in the flour, mustard and rosemary. Stir in wild rice and broth and bring slowly to a boil. Reduce heat to low, cover and simmer 10 minutes. Add the bacon, half-and-half, salmon and juice. Simmer uncovered, stirring occasionally until hot. Ladle into warmed soup bowls and serve right away.